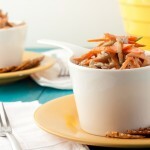 A versatile Summer vegan coleslaw done Moroccan style with matchstick carrots, cucumbers, raisins and a flavorful dressing. Pump up the protein by adding cooked chickpeas or mix in a couple handfuls of chopped parsley for added flavor. 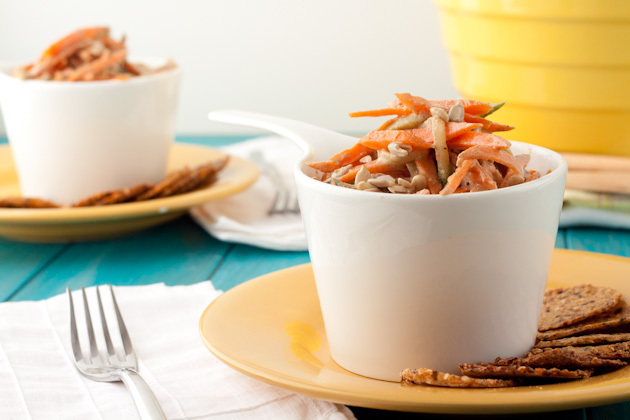 Combine carrots, cucumber, raisins, and seeds in a large bowl. Combine dressing ingredients in a small bowl. Pour over slaw and serve! You could also sprout the sunflower seeds to boost the nutrients in this salad. Or, use slivered almonds which go really well with Moroccan spices! Feel free to use nut butters too, like almond, pine nut or pistachio.